Eating flowers may raise eyebrows today, but history shows it's a centuries old culinary tradition. Today many people eat flowers without knowing it. Broccoli and cauliflower are undeveloped flower buds, Saffron comes from the stamen of the crocus flower. Many teas are made with roses, chamomile, and other flowers. 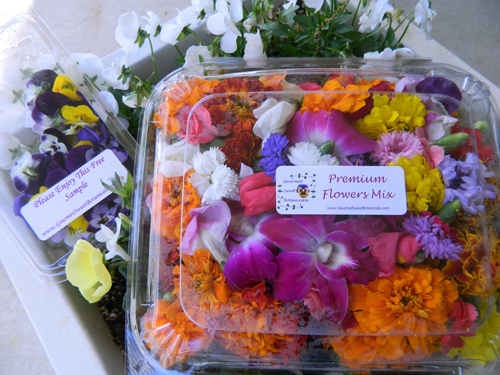 Edible flowers add flavor and color to your cooking. Some are even high in vitamins and nutrients. Below are a list of some of the most popular edible flowers. Growing flowers in potted plants outside a kitchen door is easy and fun to do. Filling planter pots on a patio with edible flowers adds fragrance and character to your landscaping and decorating needs. You can use most different types of planters but the most healthiest to use would be terracotta. This type of clay pot is meant to breathe and helps to keep the plants root system healthy. 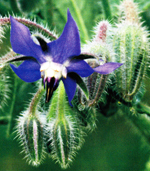 Borage: This annual grows 2 to 4 feet tall with purplish blue, star-shaped flowers. Sow seeds in a sunny spot in spring after last frost, or earlier in warm climates. Borage tolerates most soil types and usually reseeds itself. This flower adds a cucumber taste to salads, dips, and cold soups. Freeze flowers in ice cube trays to float in decorative drinks. 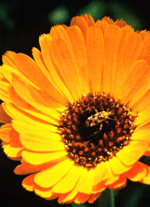 Calendula: also known as pot marigold, this annual was a favorite in medieval cooking pots. It grows up to 20" tall with attractive pale yellow to deep orange flowers. Sow seeds in a sunny spot and provide afternoon shade in hot temperatures. This flower has a slightly bitter taste. Add the petals to scrambled eggs, cheeses, poultry, and rice. Chop the leaves and petals in soups, salads, and stews. Chamomile: Another annual that has tiny daisy like flowers that can be brewed in tea. Easily grown from seeds in spring, this plant grows up to 2 feet tall in full sun. Chamomile has a sweet apple flavor and fragrance make a delicious tea. Steep 2 to 4 teaspoons of fresh flowers with a cup of boiled water for three minutes. Strain and serve. Chives: This perennial grows up to 24" tall with pink and lavendar flowers that have flavored meals for centuries. It prefers full sun and moist soil. Chives grow well in sunny windows. Break apart chive florets to add mild onion flavor to dinner rolls, casseroles, eggs, potatoes, and herb butters. Lavender: This perennial requires dry, good draining soil. It grows best in full sun. It's taste combines well with rosemary and thyme in chicken and lamb marinades. Add a teaspoon to sugar cookie and cake recipes. Introduce edible flowers into your diet gradually. 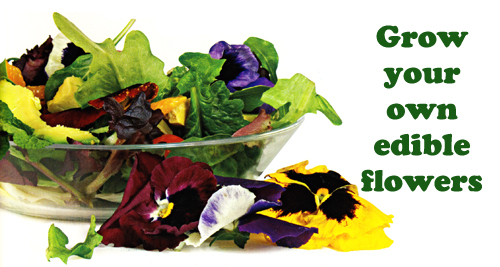 Eat only the petals on most edible flowers. Just before eating, remove interior flower parts such as the pistils and stamen. These can taste bitter, and the pollen can cause allergic reactions. When cooking with flowers, match the favors to your recipes.